In remote mountain highlands of Asia‚ a group of Buddhist monks called the Luohan achieved enlightenment through meditation‚ prayer and pure living. On the sloped of a primeval forest‚ the monks discovered and cultivated a rare fruit prized for its sweetness. This sacred fruit was named Monk Fruit‚ or Luohan Guo‚ after its devoted caretakers and was used in elixirs to increase chi‚ or life energy. Monk Fruit was used for centuries in eastern traditional herbalism to increase chi and well-being‚ earning it the nickname "The Immortals' Fruit". 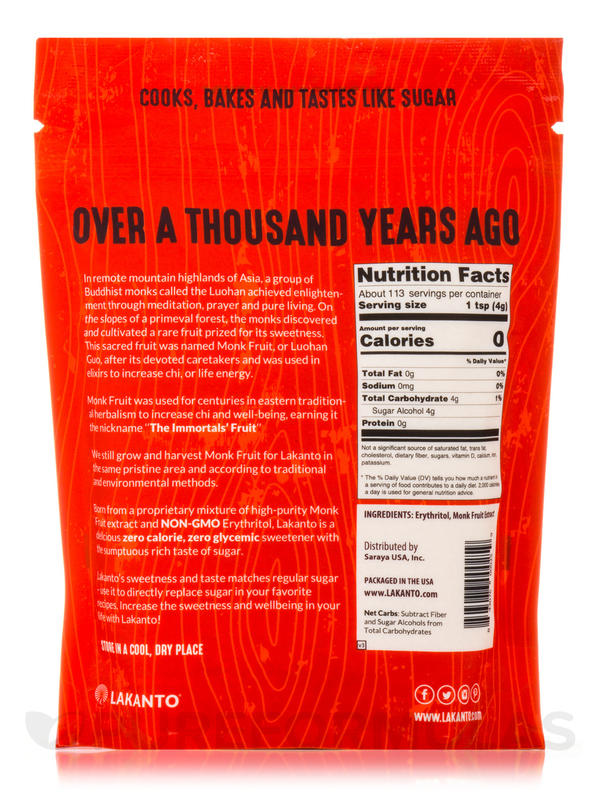 Born from a proprietary mixture of high-purity Monk Fruit extract and Non-GMO Erythritol‚ Lakanto is a delicious zero calorie‚ zero glycemic sweetener with the sumptuous rich taste of sugar. Not a significant source of saturated fat‚ trans fat‚ cholesterol‚ dietary fiber‚ sugars‚ Vitamin D‚ calcium‚ iron‚ potassium. Ingredients: Erythritol‚ monk fruit extract. Gluten-Free / Vegan / Vegetarian / Sugar-Free / Kosher / Non-GMO Project Verified. Lakanto's sweetness and taste matches regular sugar - use it to directly replace sugar in your favorite recipes. Increase the sweetness and well-being in your life with Lakanto! 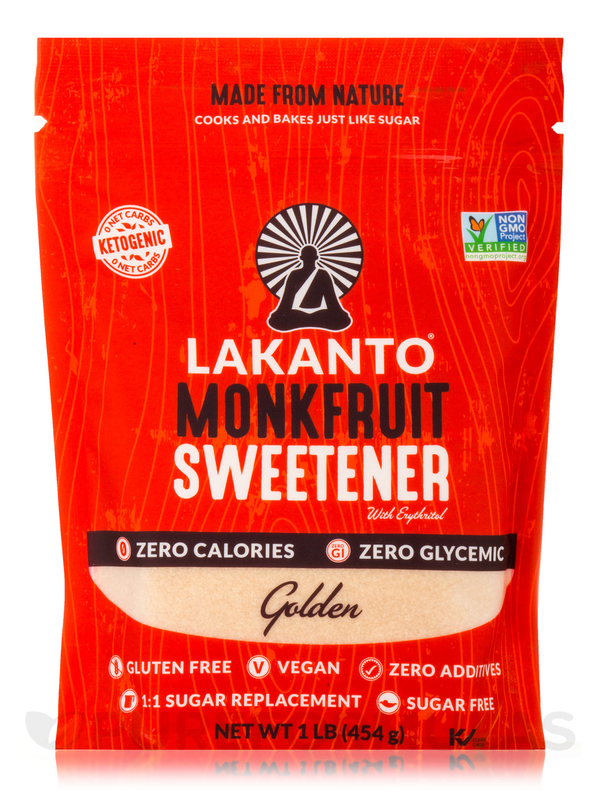 I have been trying to get my husband to stop using so much sugar in his coffee, he started using this Golden Monkfruit 1:1 Sugar Substitute by Lakanto and using way less then he was using sugar. He says he is in love with his coffee now... and so glad he switched. Pureformulas has it quite a bit less than I have seen anywhere else, most places only sell the 1/2 pound bags. Plus free shipping. It's a win-win!! 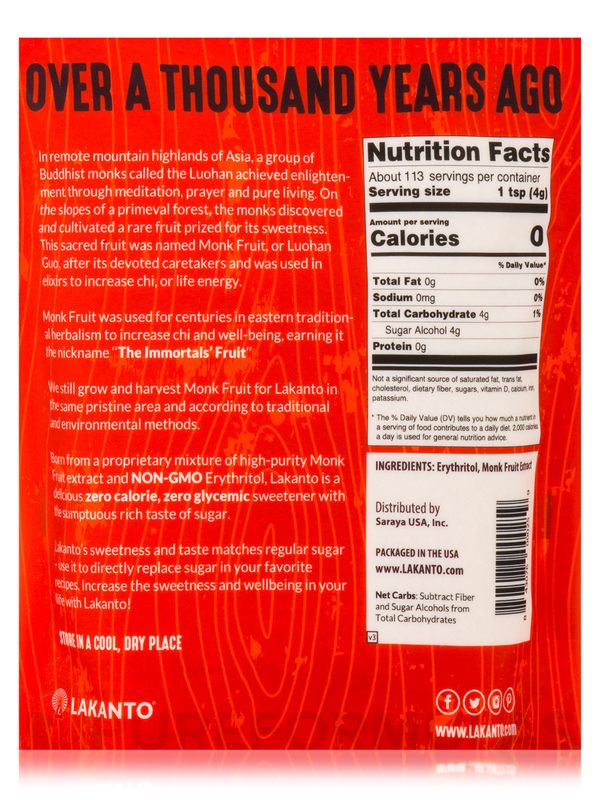 Golden Monkfruit 1:1 Sugar Substitute by Lakanto works great as a substitute for brown sugar.